The waters between Shimoda Port and Irozaki Point, which is the south end of Izu Peninsula, are dangerous, because there are many rocks some of which are hidden and others are being washed by waves. To keep out of those rocks, you take your course on the waypoint at 34 35.500N　138 51.800E off Irozaki Point and on another way point 34 38.400N　138 56.600E off Shimoda Port. 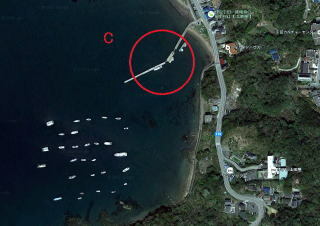 Then, head to Misago Island inside Shimoda Port as the next target. On this course, you will pass by Inubashiri Island. Passing by the light house at the island to your left, you move into the port. When you approach the port from east, the waters are always heavy off Tsumeki Point. Moor alongside at the outmost boat of a chain of boats mooring at Inozawa River. Free of charge. 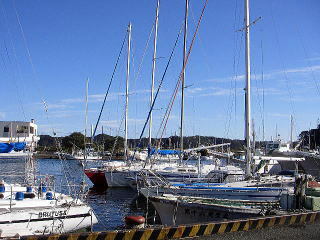 For over thirty years, boats coming to Shimoda have moored alongside here. In a summer mid night for example, sailors were working together to moor a boat came from Tokyo. There is a pontoon managed by Shimoda Boat Service at the downstream of Inozawa River. The pontoon has water and power with JPY 4,000 fee for a 33ft long boat or JPY 4,500 for 36ft. 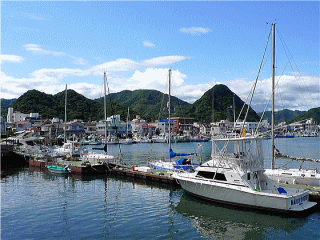 Shimoda Boat Service has a long pontoon in front of its office in the east area of the port. 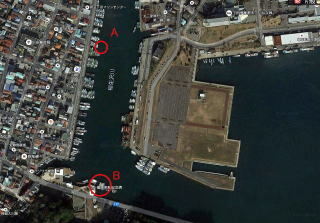 Above A) and B) berth are near an “Onsen” public bathhouse, and convenient for eating and sightseeing. At A) water is available at a gas station or toilets. A water tap near the river is locked. At B) water and electric are available at the pontoon. At A) fuel is 1 minute away. As it is a hard work to carry a 20 litters hand-carry fuel tank walking over the chain of boats, I carried four hand-carry fuel tanks on my tender boat. A good Onsen, i.e. hot spring, public bathhouse is 7 minutes away. There are many good restaurants. I recommend Japanese food restaurant “Gorosaya”. A coin laundry is close to the river. A western style toilet is 2 minutes away from B) and a Japanese style toilet 1 minute away from the river. A new very clean toilet is now built at the side of historical Sawamura House, which is at the start point of Perry Road. When I went into the port, I went through breakwaters on my left side. When I went out from the port, I went through on my left side toward the sea. At that time, I saw a black buoy which connected 40 mm rope blocked the course and extended to the offing. Thinking what happened at night, I became scared. Caution needed. I moored alongside as usual. As the tide got lowered at night, the water depth got less than one meter. As the bottom is mad, the boat got lowered without lean. But, when you approach there, you will be stuck there. Check the tide table and the depth. 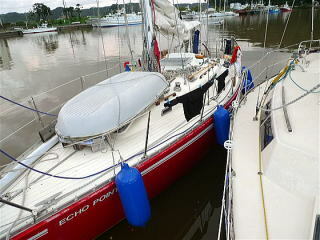 At the “mooring alongside” berth, the first outmost boat has switched places with the second outmost boat.